During WW1 Wrights factory in Quorn was employing over 2,000 people and working round the clock producing huge amounts of webbing for use by the military. Many of their employees were men, and with so many joining up once war broke out, those who didn’t, were often insulted or given white feathers (to indicate cowardice). 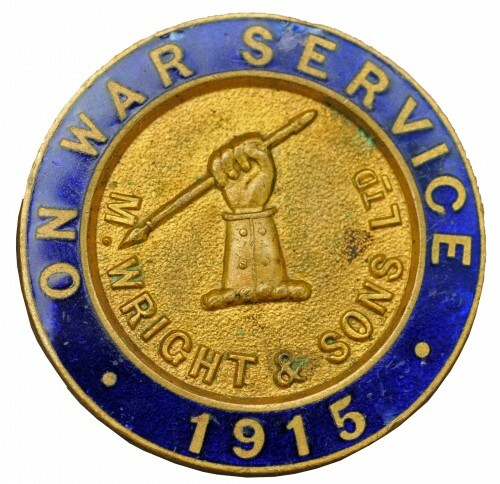 In 1915 Wright’s produced blue and gold lapel badges that a man could wear, indicating that he was employed on war work and was therefore not shirking his duty by not enlisting. Even after the government introduced compulsory conscription early in 1916, it was probably still helpful for a man to wear the badge if he wasn’t eligible for military service.